As we dive into our celebrations, let's not forget the price that was paid, the lives lost, so that we may retain our freedom today. Our FREEDOM is not something to be taken for granted. In a generation where "entitlement" has begun to run rampant, let's ALL take a step back and reassess the liberties and the privileged lives that we lead. Is it TOO MUCH to request that we be grateful for what we have? There are so many people in this world that could benefit from the rights and freedom that we are born with in America. 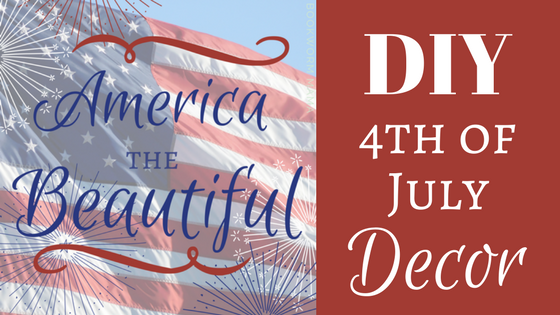 Please remember this throughout the year, but especially when we celebrate INDEPENDENCE DAY! 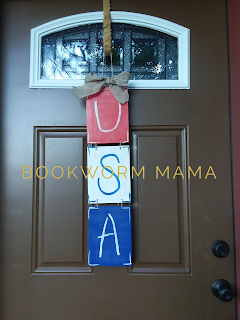 Thank you for stopping by and I hope you get some good ideas for you holiday crafts! 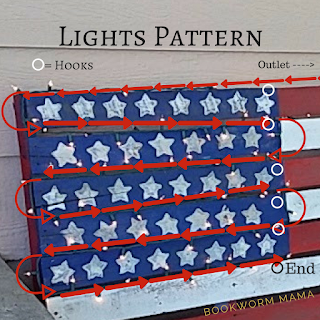 Pallet - anysize will work, but the longer the better to make a more realistic shape. Spray paint - we found Rust-Oleum General purpose paint at The Home Depot. Flat White, Apple Red, and Ink Blue. Hammer and nails or screws and impact drill (screw gun) - depending on how you want to rip apart and reattach the boards. Rip the boards off of the back of the pallet. 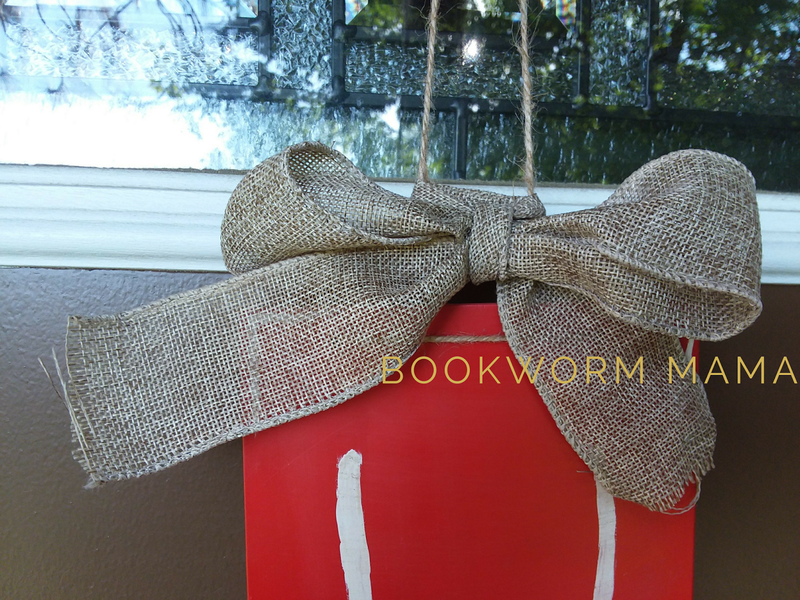 If you want a distressed look you can break off pieces on the end of the pallet. Tape off the ALL boards for where the BLUE is going to be (we did 28" from the end...you may need to adjust depending on the length of your boards, our overall length is approx. 80"). Spray paint the RED boards only (because they were the only boards attached to the front) with Rust-Oleum Satin Finish in Apple Red. We only needed 1 can of the red. 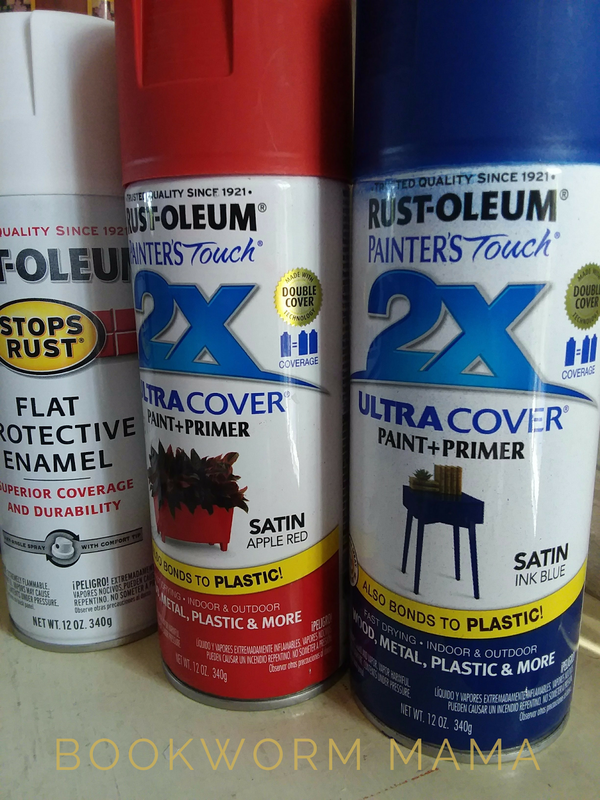 Spray paint the WHITE boards BEFORE attaching them to the front of the pallet (remember step #1?) Rust-Olem again, we could only find Flat Protective Enamel though. We needed 2 cans of the white. Let DRY and spray paint the BLUE. Make sure you tape off the red and white on the board so you get a nice crisp edge. We used Rust-Oleum Satin Finish in Ink Blue. We only needed 1 can of the blue. Let dry and attach the now WHITE boards in between the RED boards. You can nail or screw these in place, we opted for the screws. Now it is time for the POTATO. With a little help from Emma Owl I created a potato stamp. Follow her steps and then come back here to proceed. I didn't have any WHITE regular paint on hand, so I sprayed some of the WHITE spray paint into a paper bowl. I found that it was WAAAAAY better to just brush the paint on to the potato stamp instead of dipping the stamp. It would get too much paint and be overly slimy and messy. So, brushing a bit of the paint (make sure you use a SMALL, OLD brush, as the spray paint is NOT nice to fancy brushes) on the stamp place as many stars on the BLUE as you can. I made it to 38 stars. 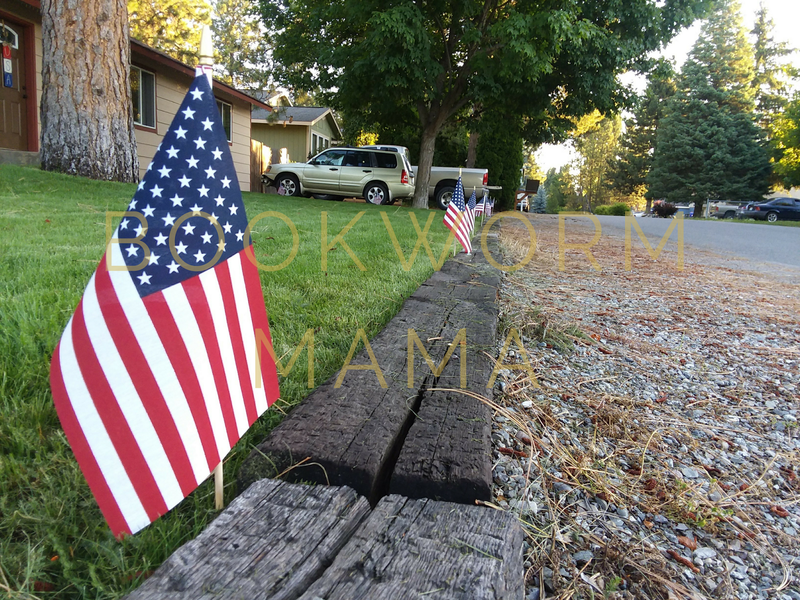 FUN FACT: The flag had 38 stars as of July 4, 1877 after Colorado was added to the Union. It remained with 38 stars for 13 years. Here is the website so you can check out what year YOUR flag ends up as. After the stars are nice and dry....Get out the dirt. 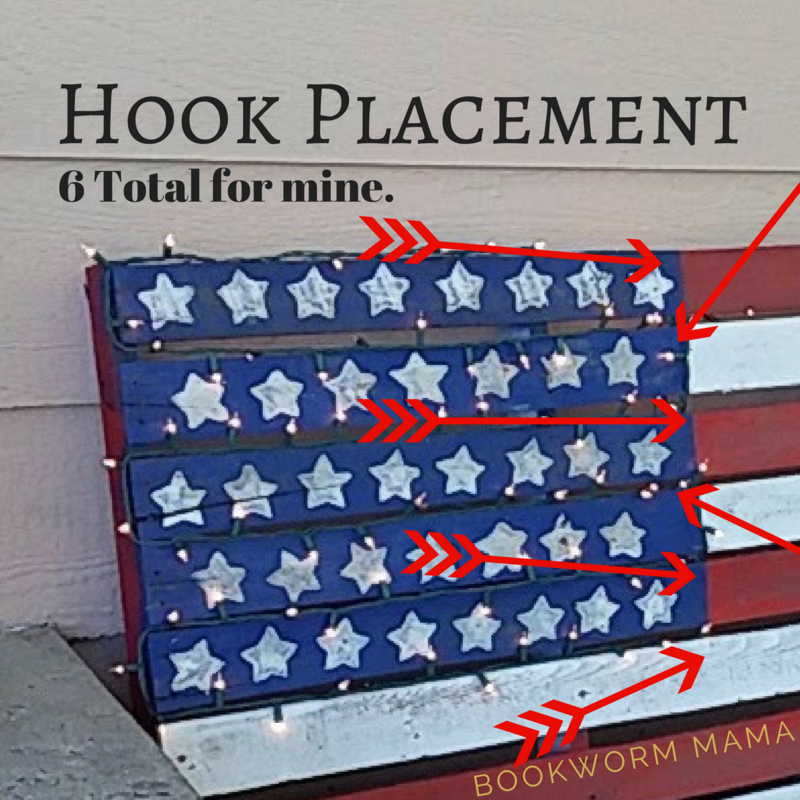 There are SEVERAL ways you can make the pallet look old and distressed, but I chose this route since it is going to be outside and in the elements year round anyways (we plan on keeping it up on the end of our house which faces a street after this week). Working row by row I sprinkled dirt right on top of the paint and used my shoes to rub it in. 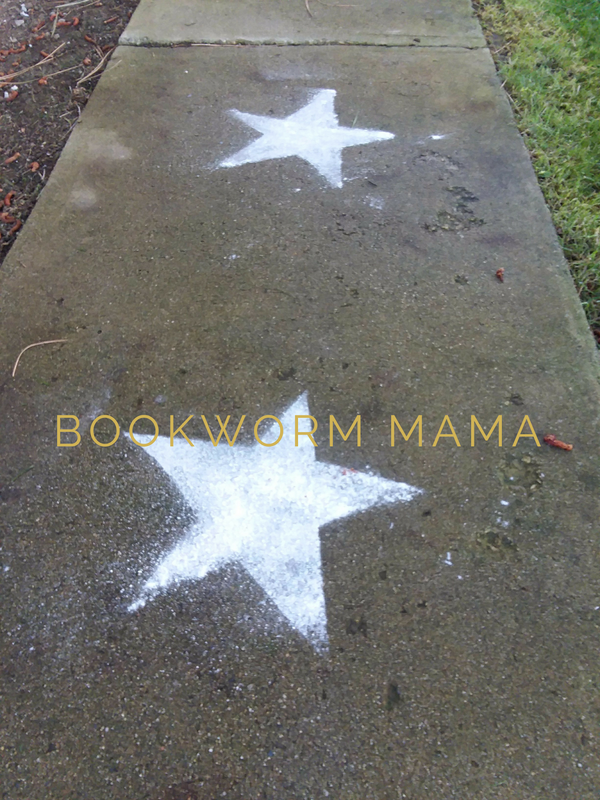 The dirt filled in the grooves and made the stars look REALLY cool. After I was done with that I went over it. With a DRY rag to brush the excess dirt off. And voila....your pallet now looks like it has sat in the dirt for several years. Now for the LIGHTS!!! 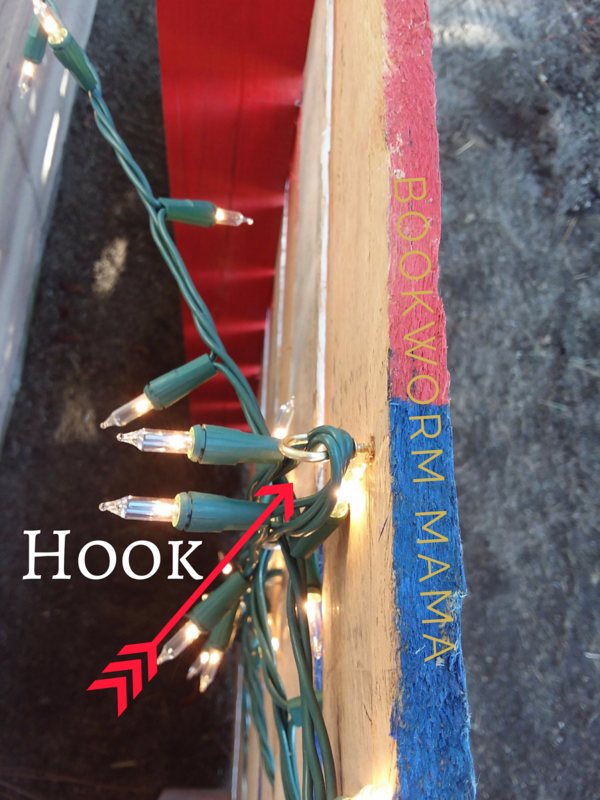 Small hooks will help to hold the lights in place. Attache the on the backside of the boards. 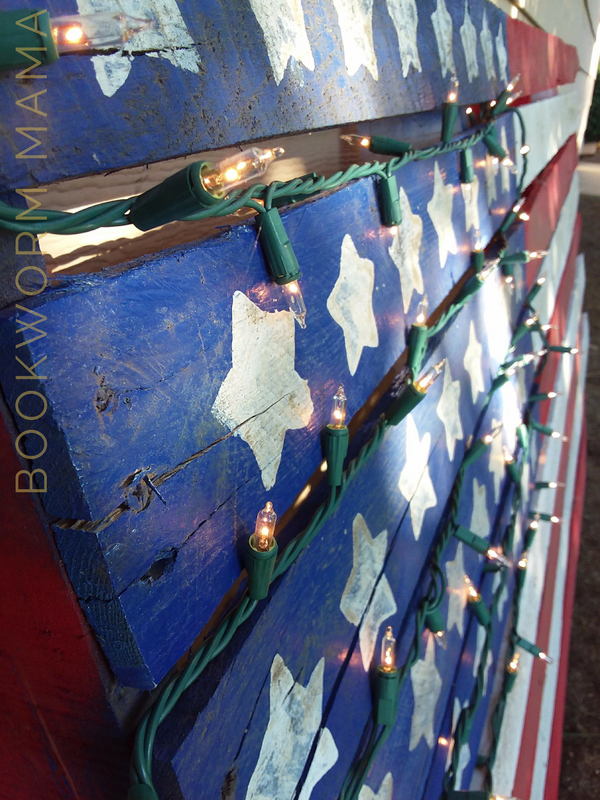 You will want them near the TOP of each board and towards the blue edge to keep the lights INSIDE the blue. 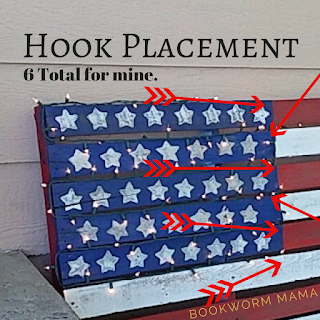 I had a booger of a time with the hooks because the pallet wood was so hard. If you pre-drill a hole with a screw it will make it much easier. If you have short enough screws, you can just use those instead of the hooks. 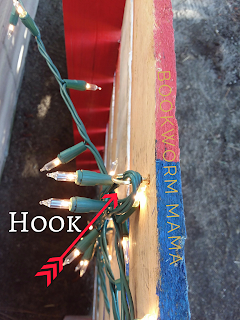 For the size of my pallet 1 standard strand of white Christmas lights was the PERFECT length. 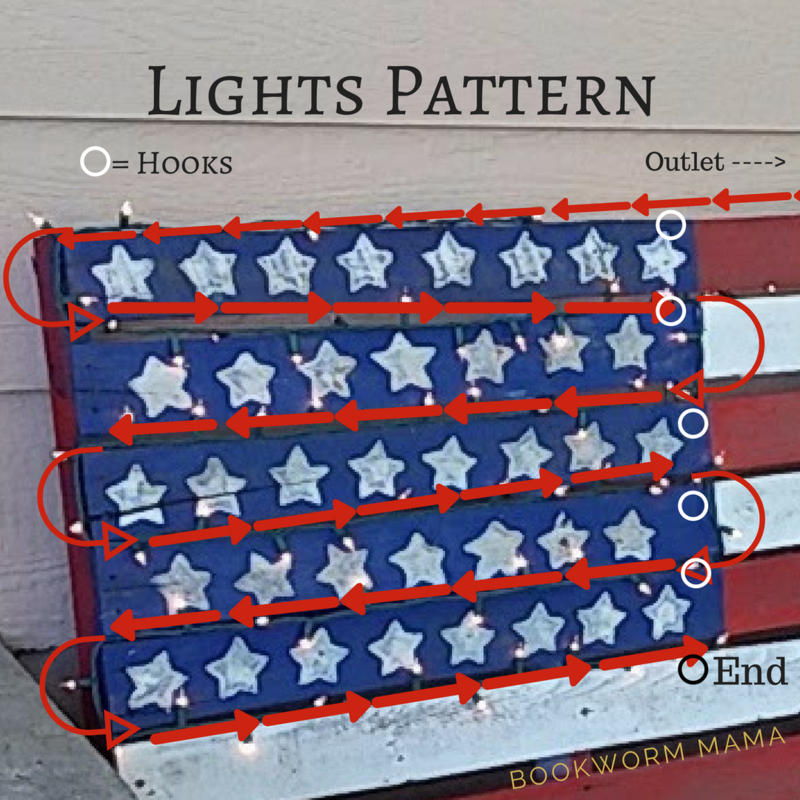 Follow this pattern to attach the lights. The giant plug at the end became problematic because it wouldn't fit through the slats, so at the end, Zach took a couple screws out and we were able to pry the slats open to push it through. The little bit if excess I had, I just wrapped it up and down the hooks. And there you have it my friends. A beautiful symbol to celebrate Independence Day. Oh my lands! I am so excited about these! Thanks to Pink and Green Mama for the instructions. So easy and they look sooooo cool!!!! This was kind of an accident....an unintentional decor baha. We had a few extra flags left over from last year. 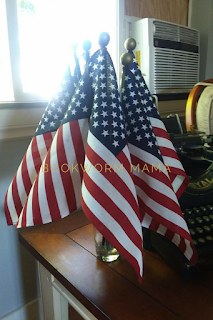 I stuck them in a vase, and I think it adds some much needed patriotic colors to our living room. 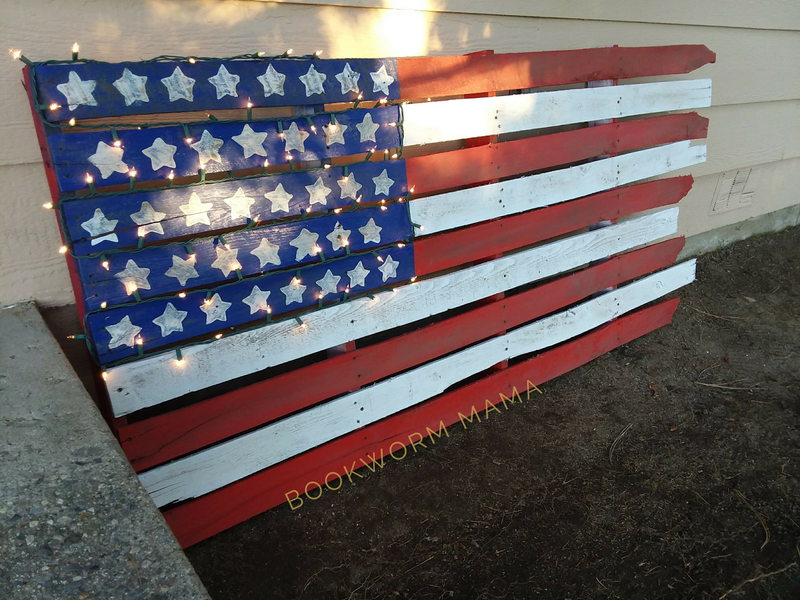 Simple, crisp, patriotic. 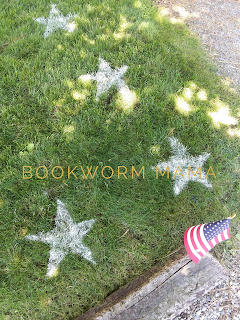 Simply stick them in the ground outlining your yard. 3 small boards - Approx 1/4" thick. All the same size!!!!!! 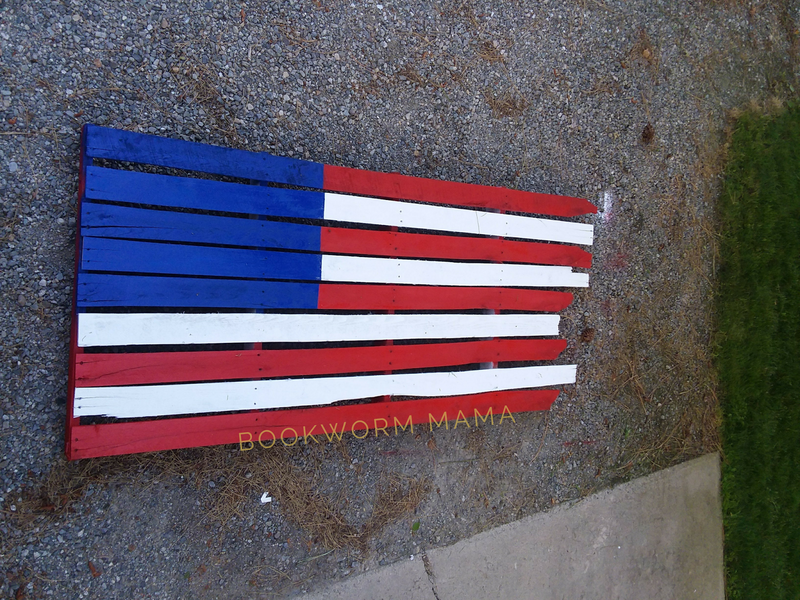 Spray paint - I used the leftovers from the pallet flag. We happened to have some boards laying around in my craft room (ok so it's really just a small dresser in the corner of my laundry room...where I usually to my crafting...because vinyl floors). They were originally made for signs so they all had 2 holes already drilled at the top. The hubs drilled two more holes in 2 of the boards for me. You don't HAVE to do two holes per side, but it will be less likely to flip around in the wind. Spray paint each board and let dry. Make sure whichever color you want on the BOTTOM is the board with TWO holes. Using an OLD and SMALL paintbrush I sprayed the paint colors I wanted to use (WHITE and BLUE) into separate bowls and painted the letters and designs. 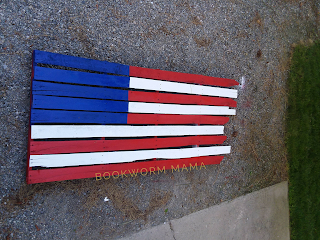 After the paint was dried, I rubbed dirt all over the boards and wiped it off. If the boards were a bit rougher, it would have worked better like with the pallet. But it is still sufficiently dirty. 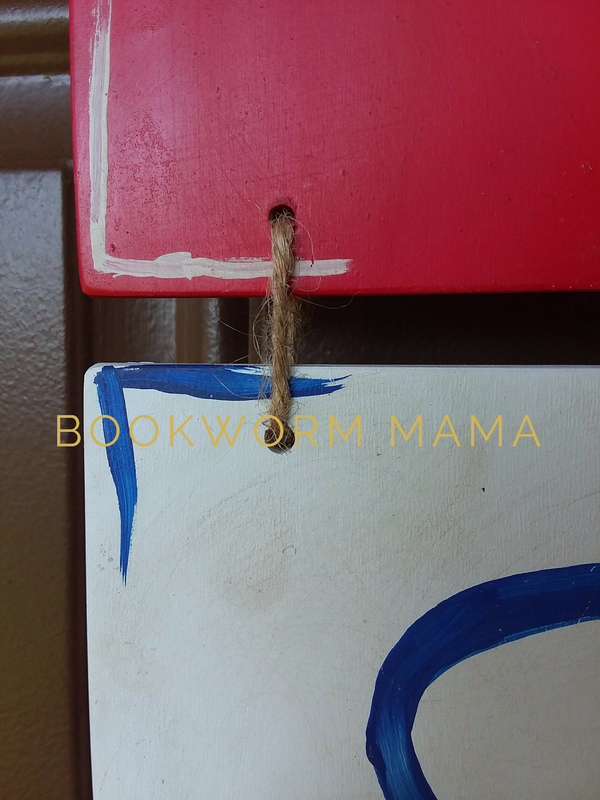 Cut twine to desired length to hang the top board from. Thread through the holes and tie a sturdy knot. I always put a dab of superglue on my knots, just in case. Cut 4 pieces of twine equal lengths, I did about 5". Making sure that your boards stay EQUAL DISTANCE apart, thread the twine through the White and Red boards and tie knot in the back. Repeat process with remaining board.. Place a dab of superglue on each knot. 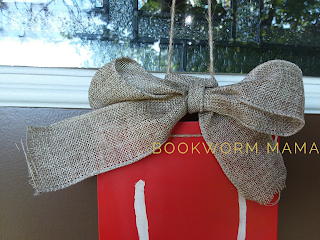 I had a pre-made burlap bow that I simply threaded the twine through the loop and hooked my sign on the hanger. I hope you were able to get some ideas from this, or at the very least sparked an inspiration for your own craft. 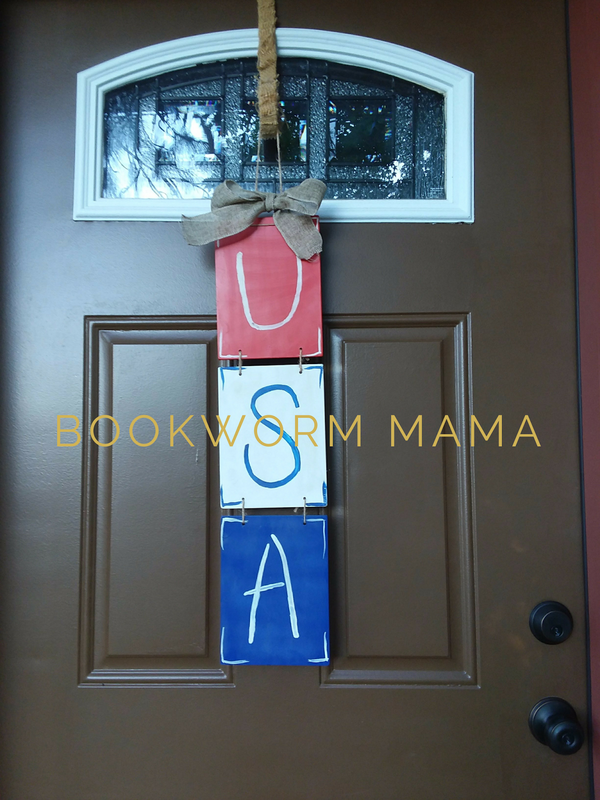 Shoot me an email with your pics, I would LOVE to see your creative patriotism! Happy Independance Day!!! God Bless America! We recently painted our kitchen cabinets! Ahhhhhh! 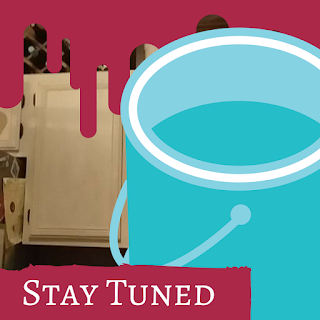 So my next DIY post will be a tutorial on how to paint and distress your kitchen cabinets (don't worry, we won't use dirt this time). Haha! Thank you my dear!